Swipe, glide, zoom and point! 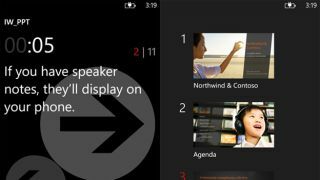 Microsoft's second screen endeavours have developed further with the launch of the Office Remote app for Windows Phone 8, giving the handset full control over the Word, PowerPoint and Excel apps. The app, which is similar to the SmartGlass mobile app for the Xbox 360 and Xbox One, allows users to swipe and glide their way through documents, presentations and spreadsheets on their PC. The standout use, of course, will be the ability for users to wirelessly control Office presentations, using Bluetooth to navigate between slides and point out objects on screen using a remote laser pointer. At present, Office Remote is only available for WP8 and only compatible with Office 2013 for Windows 8 and Office RT for the ARM-based OS, but it will prove useful for those folks who tick all Microsoft's boxes. "With Office Remote you can start your PowerPoint presentation, advance the slides, see your speaker notes, and control an on-screen laser pointer with a touch of your finger - all from your phone," said project manager Burt Van Hoof. "You can also navigate between Excel worksheets and graphs, and control data slicers from the palm of your hand," he wrote. "And you can scroll through a Word document or quickly jump to specific sections or comments. You can also navigate between Excel worksheets and graphs, and control data slicers from the palm of your hand. And you can scroll through a Word document or quickly jump to specific sections or comments." Microsoft said the initial launch is just the beginning with a roll out coming to a "diverse society of devices" in the future. We can presume that to mean an iOS and Android version of Office Remote might be in tow. You think you know Microsoft Office 2013? Here are 50 helpful hints and tricks you may not have mastered yet.